We went on a last minute deal and for the money we paid found the hotel to be fine. Booked a 1 bed apartment on arrival and were given a 2 bed, great for our 14 year old as he didn't have to share with his 4 year old sister. The room was very spacious and spotless with shower room, no bath but that didn't worry us. We were in block c across the road from main hotel, again no problem for us as we didn't get any noise from pool area. Went all inclusive, food was OK we never went hungry, basic meals but for the money we paid it was OK. The drinks on the night we found to be not good at all served in plastic cups only 2 per person, and had to queue to get these. Don't know what the spirits were but nothing I've ever tasted before. My main gripe about the drinks, if the kids wanted a coke they had to queue up with the adults and only get 1 drink. While we were there it was very hot and the bar area had no air con. The entertainment was mostly for the kids mini disco, again we didn't mind as kept our 4 year old daughter busy on the dance floor and we had a bit of a break. The entertainment team work hard with things on all day for kids i.e. pool comps, water polo, and various stuff. Overall for the price we paid had a good week and enjoyed our stay. 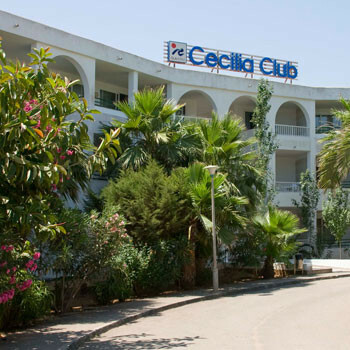 I have just spent a great 2 weeks at club cecelia,porto colom, altho a little 2 isolated for our liking. I thort the hotel complex was well run, clean,tidy and friendly staff. My only real complaint was the "spar" supermarket for us self caterers. Their prices and choices were for Tourists only, which i greatly object to and class as a con. But as always there is a way round this. The receptionist was very helpful in directing me to the "local" supermarket, for the "locals".Indeed a fantastic difference in prices, and a great proper selection of fresh and frozen foods etc. just like home. Had mixed feelings before we arrived, but better than we expected, rooms basic although only cleaned once during stay. Chose not to eat at the hotel as we found alternative eating places around at reasonable prices. Did'nt go to evening entertainment as liked to find our own. Some of the staff were friendly, but one in particular was not very considerate, waking us at 9 am in the morning when we only arrived at 5.30 am, just to sort some paper work out. My husband made the reservations for this hotel when we decided we were going to visit Mallorca. Porto Colom is a absolutely lovely little port in the quiet area of the island. The walk from the hotel is a beautiful one to get to the main port where the nicer restaurants are in the town. The beach near the hotel is extreamly crowded and, although the sea and the water is beautiful, the beach is littered with cigarette butts and trash. When we got into the room, which no one showed us to, we were met with loud, tacky fabric on the beds and curtains. We were shocked to see that we had two single beds instead of a double bed and when asked to change were informed that there were no double beds in the entire hotel, which I would be very suprised to find out is the case. While the room was clean enough it was ugly as anything. The little tv was stuck up in the corner of the room like in a prison cell, the curtains only had one thick piece of fabric and nothing to just let light in and have privacy. We often didn't leave the sliding glass doors to the balcony open because our neighbors on both sides would be smoking. Our room was only cleaned two times in the five days we were there and our very cheap, paper sealed toiletries were NEVER replaced. The shower curtain was a flimsy piece of material that left a flood on the bathroom floor. At night we had to crank the air conditioning because of the noise of music, toys and people on microphones, which didn't allow us to experience the ocean breeze. Not to mention the flourescent light spilling in from all directions, and the lack of a lighter curtain to draw close. All in all the experience was a total bust. We may return to Porto Colom but we will be giving Ola hotels a wide berth. We went and stayed here in May, the one major drawback was the distance from the town, though saying that there was nothing in the town anyway. The rooms were very big and quite comfortable, the staff were extremely friendly and hard working. The entertainment staff were realy great with both dults and kids, especially Paul. All in all we enjoyed it and the kids loved it, there is also a really nice beach across the road with some fantastic restaurants.